The last official population census was conducted in 1998 and all the subsequent numbers are based on projections using a wide array of statistical models and population growth rates. As a result, the numbers may either be over- or under-estimations. The reasons for not conducting a population census in the past 18 years are numerous, however, some observers point to the fact that a revised official number may change the resource allocation between Punjab and other units within the country. Based on the current projected numbers, the average population density is about 263 persons per sq. km. In comparison, the population density in China and Indonesia is only 144 and 133 respectively. Even 263 persons per sq. km. is a highly misleading number as it does not represent the density imbalance between various geographic units of Pakistan. Balochistan is the largest unit with the lowest population density; it accounts for 44% of the area and a mere 6% of the total population of Pakistan. If we exclude Balochistan from the equation, the population density jumps to a staggering 458 persons per sq. km. The population density is more than 1000 in all large urban centers of the country. Pakistan’s population has doubled in the last 24 years and it has proved wrong most conservative estimates to arrive at the current 5th position in the world. At 34.2 percent, Pakistan’s growth rate in the past 18 years is more than double the rates of India (15.9 percent) and Bangladesh (14.1 percent), which have long had reputations for strong growth. 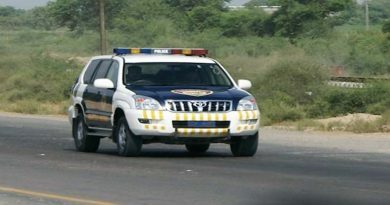 Karachi recorded the highest growth rate from 9.8 million in 1998 to a current projected 24.2 million, adding more than 14 million people (120 percent). 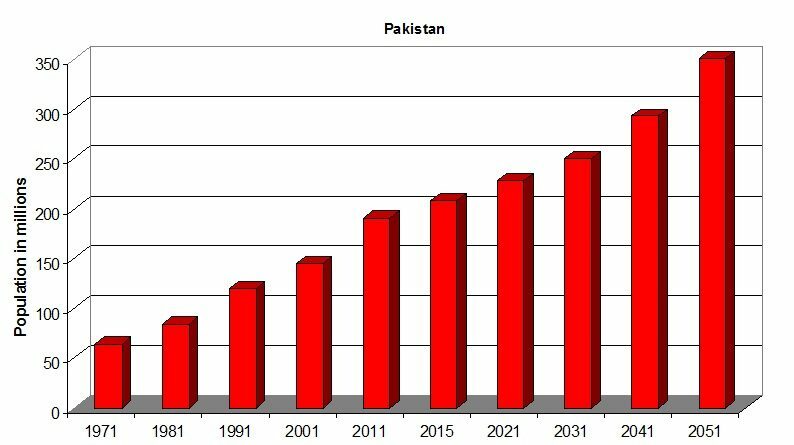 Though the growth rate has witnessed a very slow decline, at this rate, Pakistan could become the world’s fourth most populous nation by 2030, passing Indonesia. By 2050, Pakistan is slated for a population of more than 360 million. Why this population explosion? How did Pakistan arrive at such a ticking bomb? The answer lies in comparing the situation with two regional countries; Iran and Bangladesh which used a community based health and family planning approach and achieved a sustainable fertility rate. When Bangladesh gained independence from Pakistan in 1971, both were subjected to the same failed policies by President Ayub Khan. Once freed from Pakistani policies, Bangladesh adopted population stabilization as a top priority with support from all segments of the society including the clergy. An entire cadre of literate, married, community based work force was prepared to help with contraceptives and family planning. Iran, on the other hand, introduced family planning in school curriculum and restricted family size to three. Iran is the only country in the world that requires both men and women to take lessons in modern contraception before receiving a marriage license. As a result, Iranian population growth rate dropped from 3.2% in 1987 to just 1.2% in 2002. This is considered as one of the fastest drops ever recorded in population control. A higher literacy rate (84%) played a major role in this drastic decline. I am not an authority on religion, but according to religious scholars, Islam prohibits any attempts at using contraceptives and family planning. The country’s constitution is heavily Islamic and all laws are made sure to be in strict accordance with Islamic principles. The process is supervised by Council of Islamic Ideology which recently rejected attempts at banning child marriages. Consequently, population control and family planning were embroiled in politics and religion. Zulfiqar Bhutto failed to lend a strong support to family planning and succumbed to pressures from clergy. When Gen. Zia took over in 1977, he put a halt to all measures aimed at population control. Family planning programs were defunded and all media ads were banned. The end result was that by 1990, only 12% of Pakistani couples were using any form of contraception. Though the program was revived in mid 90s, Pakistan still reels from Gen Zia’s catastrophic policies. The process of Islamization started during early 80s has drastically changed the very fabric of Pakistani society and it is still a taboo to talk about family planning and population control. Catering to the needs of 210 million people is an uphill task for a failing state machinery. Over-population is the mother of all ills; unemployment and underemployment are its direct consequences. Most nations have converted their human resources into opportunities and put them to nation building and constructive activities; Pakistan is not one of them. Impressionable minds fall a pray to terrorist propaganda as they are not gainfully employed. Illiteracy is another corollary of population explosion. There are not enough schools to absorb the booming babies; 26 million children are out of school in Pakistan The resulting vacuum has been filled with religious schools (madrassas), most of which are producing citizens which don’t fit in a 21st century society. Some of these schools are producing Jihadi mindsets. Therefore, over-population, illiteracy and terrorism are intimately related to each other. Over-crowding has resulted in crumbling infrastructure. Notwithstanding a few recently built toll roads, the road and bridge network is in a dilapidated shape and needs immediate repairs. The country has been losing railway lines which it inherited from the British Empire; not a single mile of track has been added since 1947. Almost all civic facilities are in disrepair and crying out for help. Needless to say, over-population is putting a severe stress on Pakistan’s fragile environment. If the expanding population is not controlled through immediate measures, the current turmoil will continue to worsen. Pakistan must seriously address its growing resource scarcity, especially depleting drinking water resources. The air quality is dangerously unhealthy and there are no monitoring or corrective measures for the air pollution in the country. Pakistan needs to stop all other wars and pay attention to the population explosion at a war footing.